Teatime is served with a side of enviable treetop views at the pod-shaped Teahouse Riedenthaln nestled in an Austrian garden. 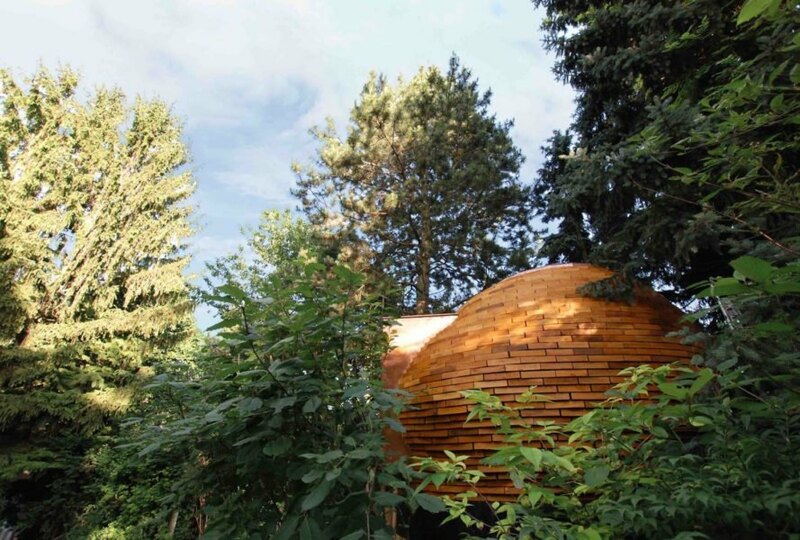 Architecture firm a-lp architektur designed the curious igloo-shaped timber hideaway as a modern interpretation of the traditional Japanese teahouse. 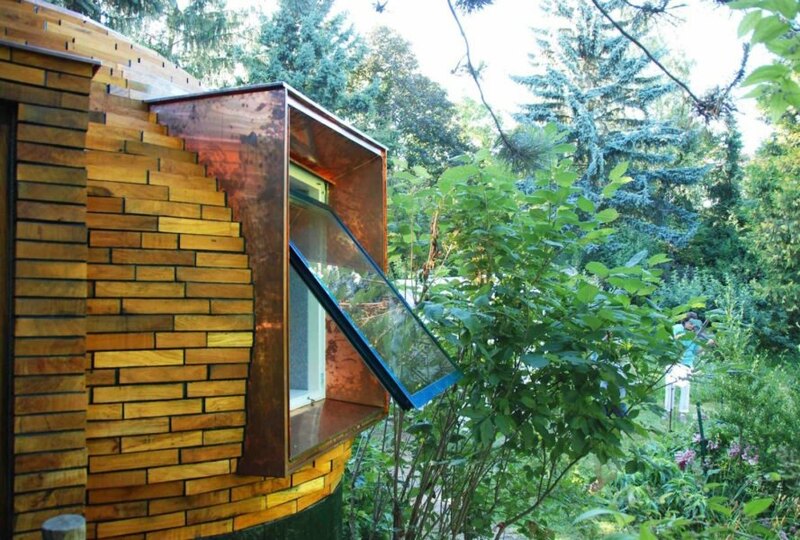 The 10-square-meter elevated space was largely built from recycled oak wood offcuts. 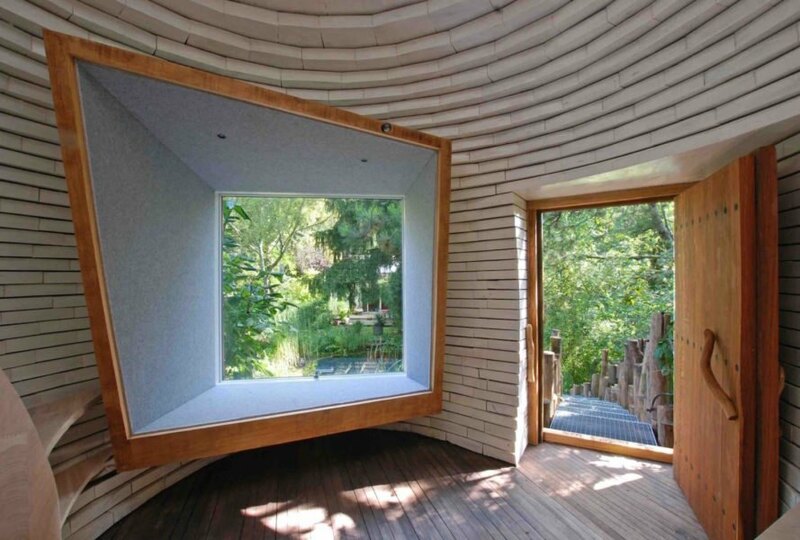 Located in a private garden, the spherical room serves as a place to drink tea, for hosting regression therapy clients, and as a possible sleeping area. A ramp leads up to the low and narrow entrance that opens to a light-filled and surprisingly spacious interior. Natural light fills the cave-like space through a large painted skylight and two rectangular windows. 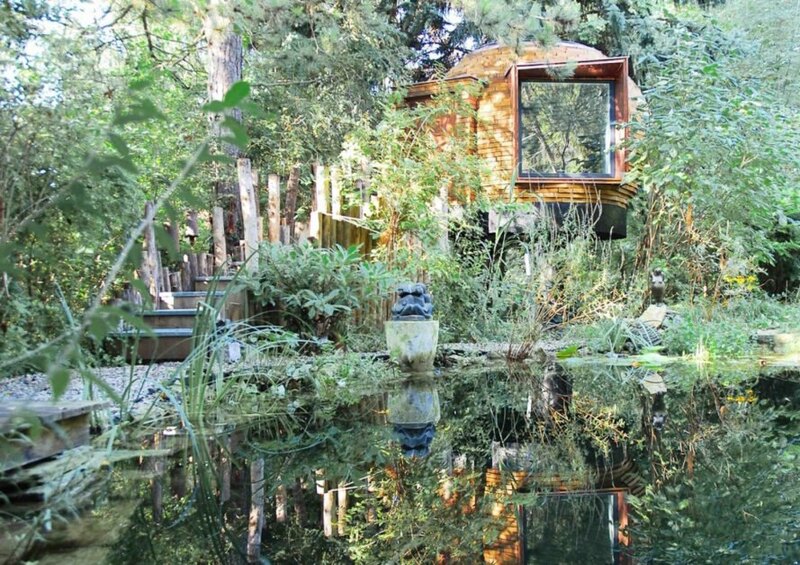 The tiny teahouse retreat is raised on four black-painted pillars, made of tree trunks. Locally chopped oak timber was used as the main material for the teahouse. The wood cladding was recycled from the small timber offcuts of a local wine barrel-maker and assembled in stacks of over forty layers. The furniture, which includes a counter with a sink, window seat, and sleeping area, is also made from oak timber. 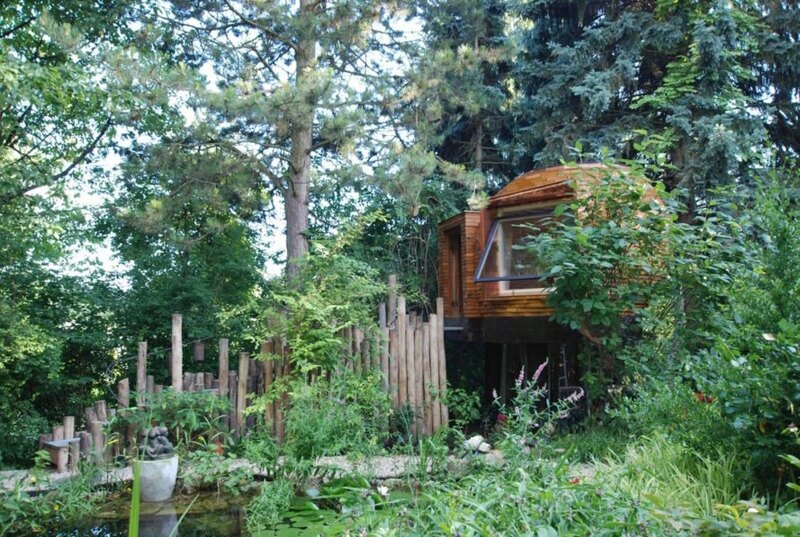 Located in a private garden, the spherical room serves as a place to drink tea, for hosting regression therapy clients, and as a possible sleeping area. Natural light fills the cave-like space through a large painted skylight and two rectangular windows. 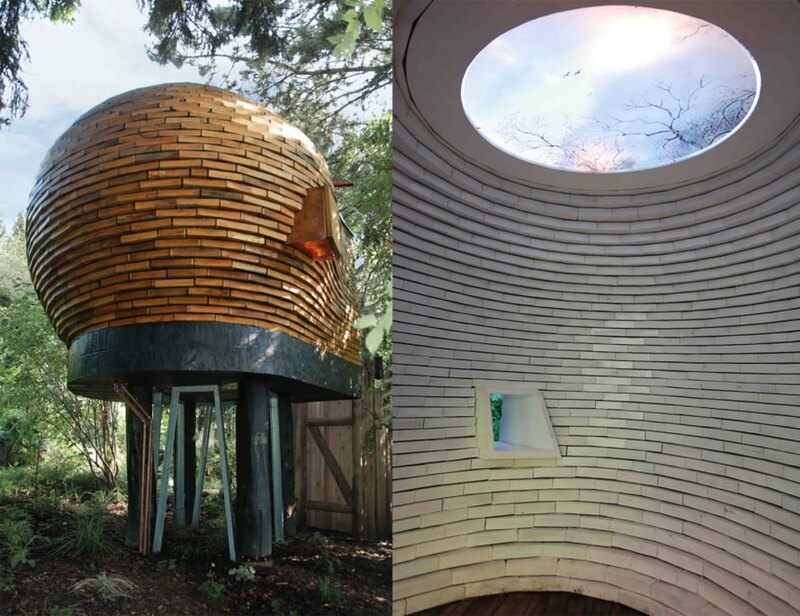 The tiny teahouse retreat is raised on four black-painted pillars, made of tree trunks. Locally chopped oak timber was used as the main material for the teahouse. The wood cladding was recycled from the small timber offcuts of a local wine barrel-maker and assembled in stacks of over forty layers. The furniture, which includes a counter with a sink, window seat, and sleeping area, is also made from oak timber.